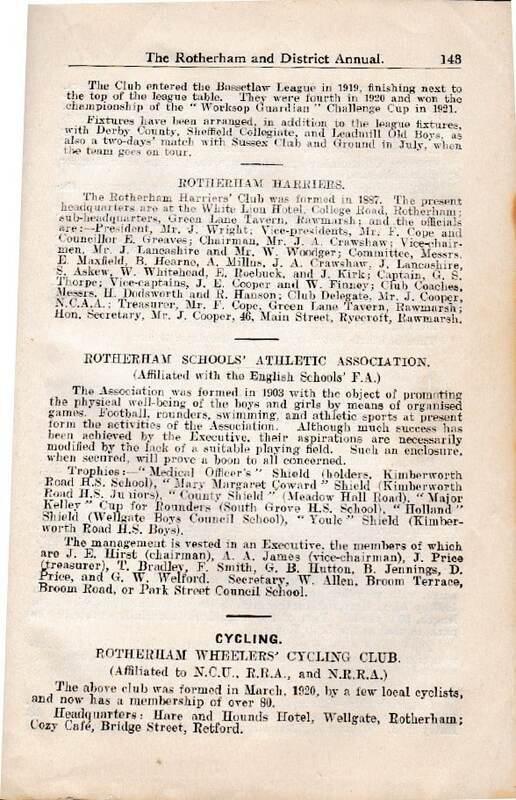 The Rotherham Wheelers was founded at the White Swan Inn, college road, Rotherham in 1920. the club soon developed into one of the most noted in the area. founder member H.C (Cliff) Henderson was a long standing president, still active in the 1970’s. 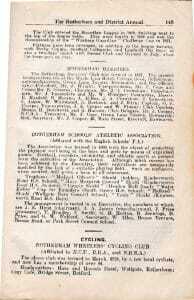 He along with Wilf Ball soon had the club on the map with their racing skills. Cliff won the first club 50 in 1920 with a time of 2h 28m 51s. 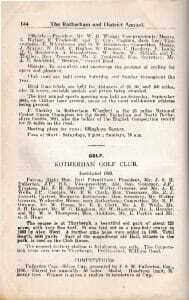 Wilf was the club champion in 1930 & 1931. He won the club 50 in 1929; club 12hr 1928/29/30/31/33/ and won Newark and back in 1928/29/30/31/33. 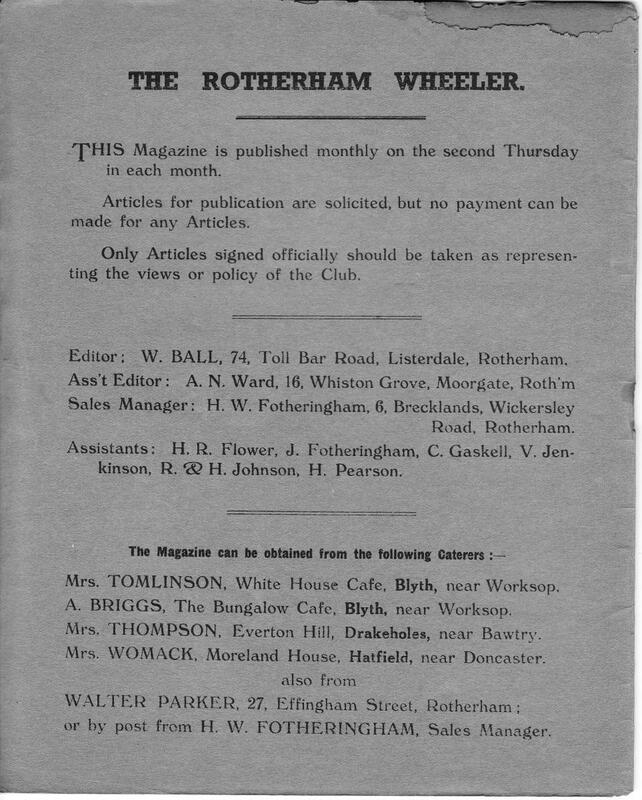 Wilf also being a printer, produced a magazine called the Wheeler in the 1920s. This was distributed around many counties by club members of other clubs and the members of those days had some very weird stories to tell. In the later years, late 1920 & 30, riders with great speed joined the club. Ernie King, one of the clubs greatest, won the novice in 1929 and went on to be senior champion in 1932/33/34/35/43/44; club 25 winner in 1930/31/32/33/34/35; club 50 winner 1930/31/32/33/35/44. Ernie won so many open and team events his stock of medals was so great that they could not be left to collect dust. so at the 50th anniversary dinner, Ernie presented them to the club and they were incorporated into the presidents sash of office. Wog Henderson (Cliffs brother) was a prolific winner too. especially on the trike. he won the novice in 1932 with a time of 1h 16m 2s; won the club 50 in 1934. In may 1932 he was 6th in the best all rounder competition, average speed 20.858 mph and he finished in 5th place. The winner being Ernie King. Wog beat all! records – one being the 100 on the trike with a time of 5h 8m 37s. He won the trike bar competition over 50, 100, 12hr with an average speed of 19.049mph. He also set up new records for the trike over 25, 50, 100, 12hr loving further forward to my time of joining 1951. The club was still run with great passion by the older members. 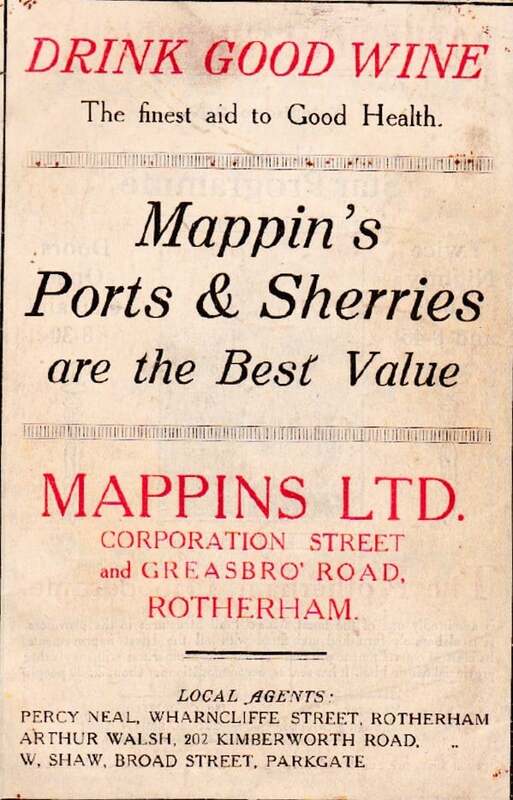 Marlow Lenton joined 1923, lived in Sheffield was chairman for many years and despite the distance always took his seat to chair the committee. In those days we had six vice presidents. This I believe because so many worked so hard for the club. At one AGM, there was a vote for VP and I remember the ones that lost walked out in disgust. that how keen members were back then. The main meeting place was Siddalls Cycle shop. 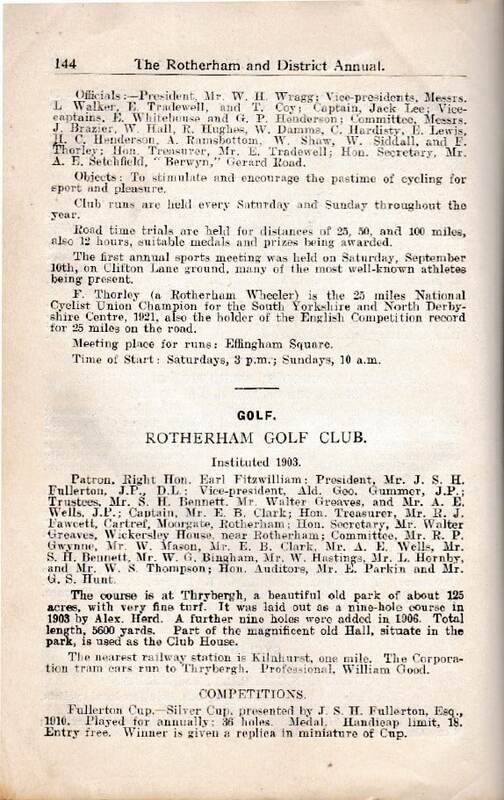 Billy Siddall being another of the star riders winning the club 12hr in 1920 & many open events. 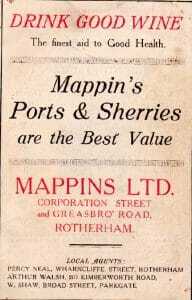 The shop was now owned by Geoff Fields who loaned us the room above the shop for our committee meetings. A great bunch of lads joined around this time 1950/51/52. Most ended up running the club in some form. I went through the field – v.capt; capt; racing secretary; social secretary & treasurer. Bob Fields a long standing secretary; ccl wade – racing secretary; John Milner – treasurer; Mary Donovan – hon secretary; Malc Marples – captain and many others. 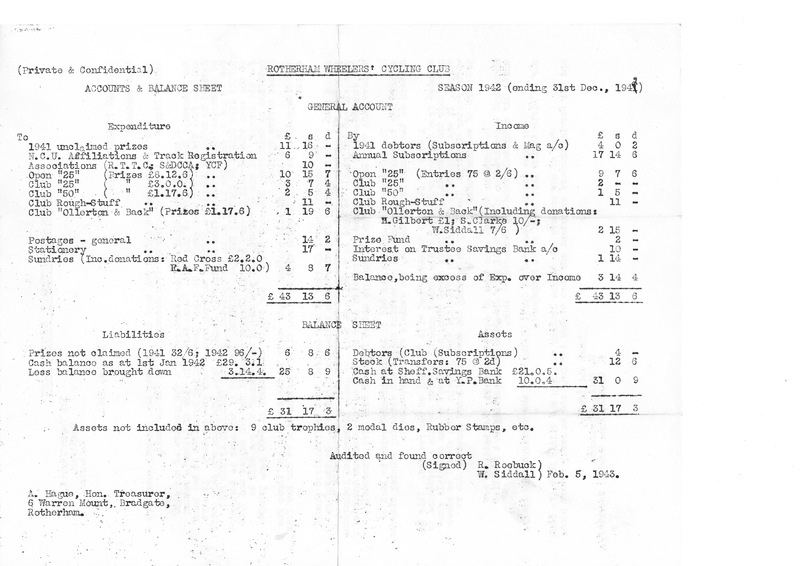 1952 saw the wheelers off to Holland in an exchange visit with the Amersfoort Pedalriders. We all left Effingham square and cycled to Hull. Here all the bikes were dropped through a hole in the deck of our little what seemed like a fishing boat. A huge reception awaited us in the town square on our late arrival. We were then all allocated to our respective families with whom we were staying. During our stay they had arranged a few races on a closed circuit of which the surface was of all things cobblestones. However we trundled round in a pursuit race and at the end we were presented with pre-made winners badges – I think a fix. 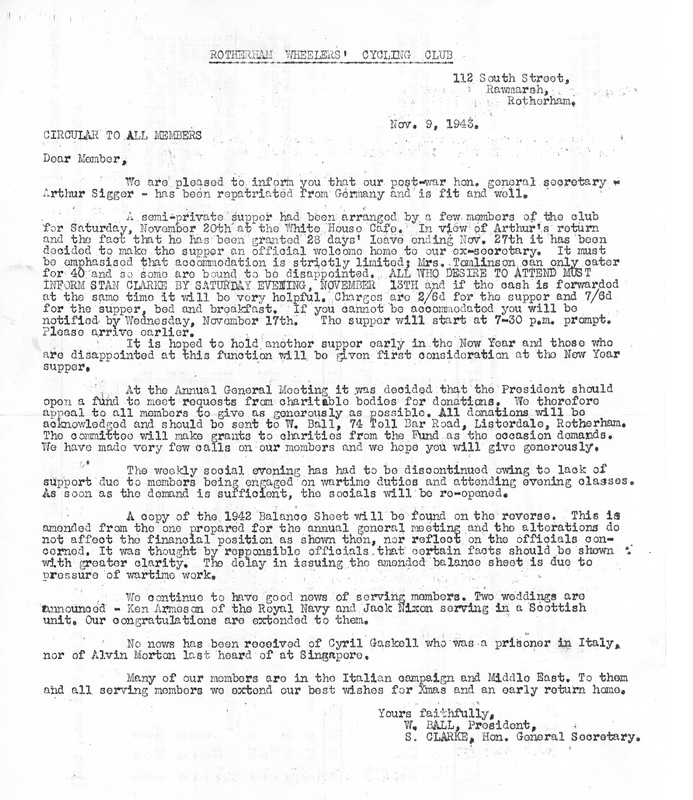 The following is a copy of a RWCC publication from November 1937. This was kindly donated by Mr John Hinchcliffe of Tarrant Hinton, Dorset who is a former member of Huddersfield Star CC.